June 28, 2012 in "KAL"
The whole thing sounds like a ton of fun. I love a KAL! We've hosted a few TFA KAL's recently and they are always so inspiring. I'm the first to admit that I don't have the best track record when it comes to completing my project on time. I tend to view KAL's more as motivation/inspiration, it's not a test or a race, nothing bad will happen if you don't finish on time! Yesterday was cast on day and I had yet to pick a project. I had something simple in mind, then I wondered if maybe I should use the KAL as an excuse to work on a design... In the end I decided that I should use this as an opportunity to pick a pattern that I loved and do some completely selfish knitting. I looked through my favourites on Ravelry and the sweaters I had pinned on Pinterest but nothing was jumping out at me. So I turned to the KAL Yarn/Pattern chat thread on Ravelry and browsed through what other participants were planning. Isn't that part of the beauty of a KAL! A community of knitters all chatting, supporting and inspiring. And right there is where I found it, the best thing I've see in ages! Nanook, by Heidi Kirrmaier. I've seen the Bear Track stitch pattern (the one featured on the collar) before, but was never really struck by it until I saw this cardigan. I love how it's used to work the collar, how it creates that gorgeous scalloped edging and how it looks fantastic from both sides. 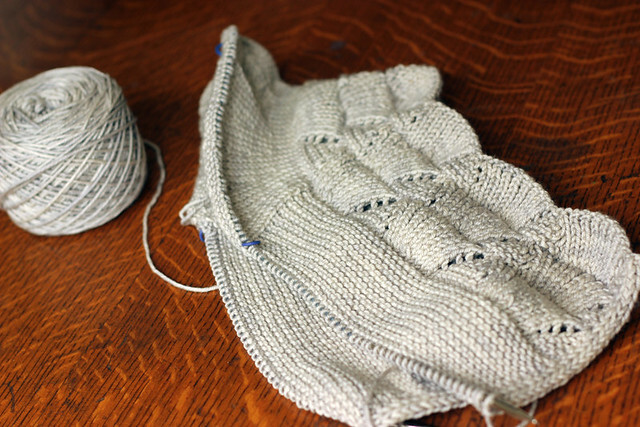 I also love that the pattern features really neat yoke increases, not just your standard raglans or set in sleeves. I'm really into the style and the fit of this casual layering piece. Is there anything not to love!? I've chosen to knit this cardigan in my Orange Label Cashmere/Silk Worsted weight yarn because A) it will be fabulous! and B) the silk in this yarn adds a nice little bit of extra drape (as compared to my Green Label 100% merino Aran weight yarn) and I think that the drape will work really well for this pattern. Typically I opt for a bright, saturated colour, but after falling in love with several really pretty, serene versions of this on Ravelry I decided to go with my palest, calmest colourway: Sand. I cast on last night and I'm already well into the yoke. The yarn knits up like butter and the pattern is coming together beautifully so it's hard to put down! I am really enjoying knitting this and it got me thinking a bit about my knitting habits. Since I started designing I've been knitting a lot more of my own patterns and a lot less of other designers patterns. That's all fine but I've realized that as a designer it can be extremely helpful, insightful and educational to work from other's designs from time to time. For me at least, it's so nice to take a break from my own head, not have to be super critical about every stitch I make, and instead knit for the pure enjoyment of it. I can't tell you how happy I am just stitching away on this sweater, reading the pattern and not taking notes after every row, just merrily following directions and doing what I'm told. I've already learnt a new slipped stitch edging that I think is really pretty and neat, so even though this knit won't result in another TFA pattern for me to sell, the experience isn't any less valuable to me. I think I've just had a an aha! moment.